Book of the Week: The Land of Forgotten Girls by Erin Entrada Kelly – hello library! Sol and Ming are sisters, and five years ago, after their other sister drowned and their mother died, they moved from the Philippines to Louisiana with their father and wicked stepmother. And then their father abandoned them too, leaving the girls all alone with evil Vea, who never wanted them at all. Well: not all alone. They still have each other. And they have their mother’s stories. She used to tell them amazing stories: about a tall man in their town who used to be a string bean, about talking animals, and most of all, about their Aunt Jove, a woman who’d been to every country and ridden an elephant and danced with the Queen of England. Sol is twelve, and she knows her mother’s stories aren’t real. 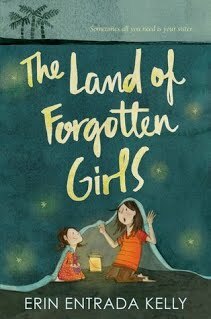 But six-year-old Ming starts to believe that they’re really in a story, that they are sister princesses, and that Aunt Jove is going to come rescue them from their stepmother. What Sol doesn’t realize is that her mother’s stories aren’t real, but they do have power. Aunt Jove isn’t going to save them, but if they listen close, they can learn how to save themselves.